When we first started talking about homeschooling, I very early on fell in love with the Steiner style of schooling – it felt like such a good fit for our family, and gave us lots of options for working around our various concerns that led to us wanting to homeschool in the first place. As I surfed Pinterest, something that came up a lot were gnomes and fairies and all manner of little people made out of felt and pegs. Of course, with that much cuteness, how could I resist making some to use in our lessons? So off I toddled and ordered myself a dozen peg people and a pack of rainbow felt. 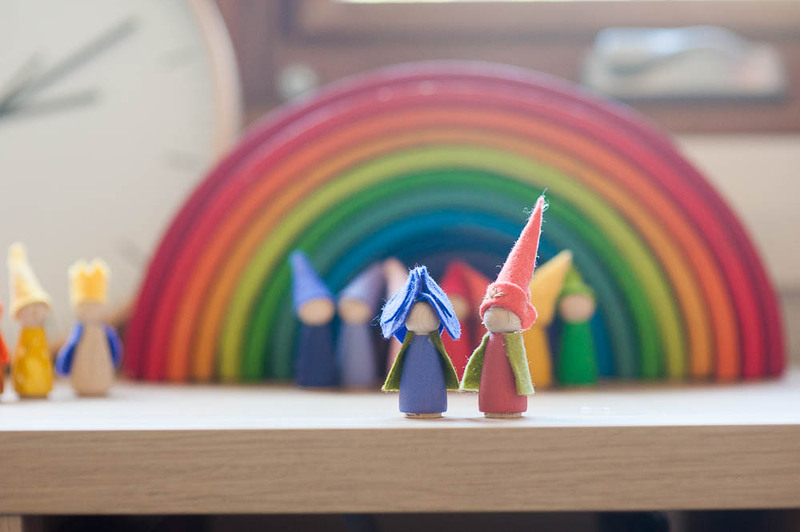 An hour or so in the craft room, some paint and a hot glue gun, and we had ourselves a rainbow of gnomes – which matched our Grimms rainbow almost precisely, making my matchy-matchy heart very happy! Then came the discovery of natural tables and seasonal trays. So of course we needed seasonal gnomes. Summer was a Sun Gnome and a Water Gnome. Autumn, two little russet Leaf gnomes. Winter we kind of skipped the gnome making, but I just finished the spring gnomes last week. Well. one spring gnome, and one little flower munchkin. We also have a little King gnome as well, from a Sunday school lesson where I could easily use my existing gnome collection and Grimms fire stacker…I’m not going to lie, these little people have become super addictive to make, and I’ve become quite adept at manufacturing the smallest excuse to make more! Today, we are gearing up for round two of birthday season. There’s a house to be cleaned and a cake to be baked and some last minute secret squirrel sewing and presents to be wrapped. It’s shaping up to be a glorious spring day out there, so I’m pretty sure it’s going to be an outside school day. There’s a pair of shorts just needing a waistband to be finished. A bit of cross-stitch maybe while the children work. Stories and games and chores and more stories, and wrapping it all up with swimming lessons and a BBQ dinner. Just the way Fridays should be. Have a fab weekend, friends! This is project seven of 26 for the Make All The ThingsChallenge I am doing with Carrose Creative. You can see my other finished projects here. Please feel free to play along if you would like and drop us a link in the comments to your project! Cute! I’m thinking the plant one will be easy to cross off?!? These are so cute!! I think I’m going to have to make some for M!